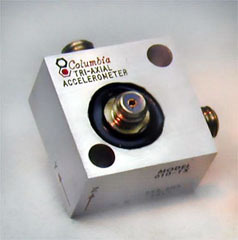 The Model 610-TX Triaxial Piezoelectric Accelerometer performs simultaneous measurement of vibration acceleration in three, mutually perpendicular axes. It is an excellent choice for general-purpose shock and vibration measurement work where a threedimensional characterization of dynamic responses of a structure is required. The relatively low mass and small size of the 610-TX recommends it for the testing of large or small specimens. The 610-TX incorporates miniature shear type accelerometer inserts bonded into a machined aluminum block. The electrical isolation provided by the epoxy bonding permits accurate, repeatable measurements even in noisy industrial environments. Two mounting holes allow the unit to be bolted or bonded to the test specimen. The Model 610-TXHT is a high temperature version that will operate in environments up to +500 Deg. F.